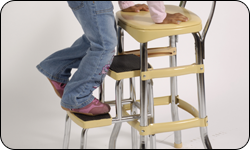 Falls are the leading cause of non-fatal injuries for all children ages 0 to 19. Every day, approximately 8,000 children are treated in U.S. emergency rooms for fall-related injuries. This adds up to almost 2.8 million children each year. Each year in the United States, emergency departments treat more than 200,000 children ages 14 and younger for playground-related injuries. About 45% of playground-related injuries are severe–fractures, internal injuries, concussions, dislocations, and amputations. Check to make sure that the surfaces under playground equipment are safe, soft, and well-maintained (such as wood chips or sand, not dirt or grass). Supervise young children at all times around fall hazards, such as stairs and playground equipment, whether you're at home or out to play.